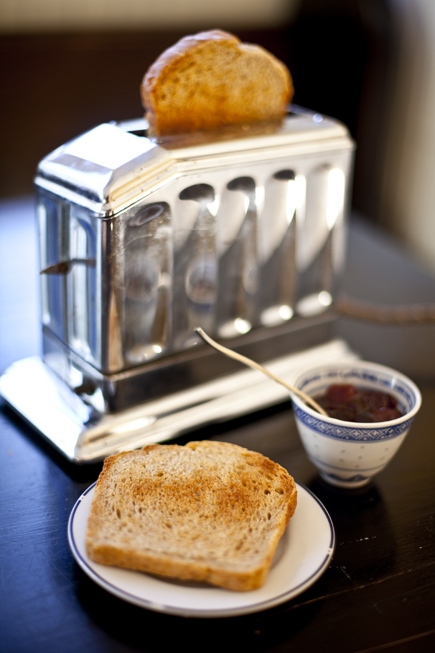 My favorite breakfast is a homemade bread, toasted to perfection, fruit preserves, and a cup of freshly brewed coffee. I know it sounds simple, but getting that bread to caramelize and crisp up on the outside, but have a soft interior, isn’t always as easy as you may think. We’ve heard from some readers that they have a difficult time toasting, so here are some simple steps to getting a perfect slice. 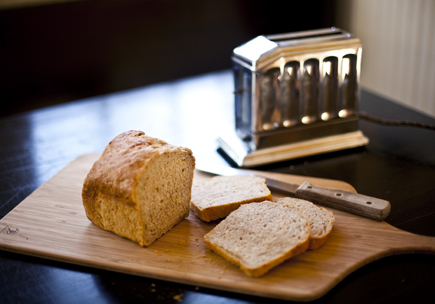 It is very important to cut the bread using a very sharp, serrated knife, into 12.7 millimeter slices. Some people swear by an Electric Carving Knife, used most often for the Thanksgiving turkey, but I like the old fashion Bread Knife or Tajima JPR Rapid Pull Saw with a 18 TPI blade myself, although it produces a few more crumbs. The key is having a SHARP blade and use a gentle sawing motion, so you don’t push too hard, which may crush the loaf as you cut. A speed of 17.6 strokes per minute is just about perfect. I admit my chrome toaster is more attitude, than practical, but pretty much any Toaster, Toaster Oven, Toastmaster Heavy-Duty Range broiler, Gas Grill, Butane Blow Torch or Branding Iron will get the job done. I like my toast very crunchy, so I put it on the longest setting. The internal temperature of the slice should reach about 211°F, as measured on a CDN DTQ450X ProAccurate Quick-Read Thermometer. Sometimes I’ll even push it down twice to get nice burnt bits, which I think contrasts well with Door County Sour Cherry Preserves (recipe page 213 Artisan Bread in Five Minutes a Day). I have an excellent toast recipe using a SousVide Supreme Sous Vide Water Oven, but it takes 6 hours, so I’ll save that post for another day. It is clear that the toaster is all about attitude since only a die hard toast aficionado would use a toaster with a missing knob on the lever. Does the temperature of the level give you better insight into knowing when the toast as reached precisely 211˚F? I’ve just found artisanbreadinfive.com for the first time and was delighted to see a recipe for toasted bread, as that’s all my wife wants to use bread for. Normally I would read the recipe and instructions thoroughly, but for some odd reason began by looking at the comments. I couldn’t understand why people were joking about it until I looked at the dates of the posts, then scrolled back to the top and the answer was there ! But my search goes on for the perfect toast ! Fred: Great toast is the simple luxury everyone can have! OK Zoe, you got me. And here I thought I was on the ball today and NOBODY was going to pull one over on me! Congrats! It took me all the way till “17.6 strokes per minute.” My first laugh of the day. Thanks, Zoe! The “12.7mm slices” did it for me! Thanks for the chuckle! (And for your delicious — and EASY — breads, one of which is in my oven even as I type! Love the book, and love today’s post. I’m still chuckling…. one of the best toasts I’ve had lately was when we tried to make a ‘loaf’ out of the olive oil pizza bread…it got hard and crusty on the outside and didn’t get all done on the inside but it was PERFECT for toast! 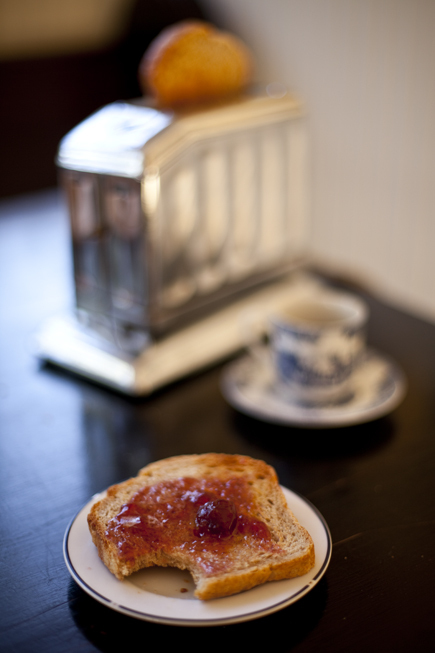 Got ‘done’ and crunchy in the toaster…perfect with butter or strawberry preserves…and some fresh coffee, too! You completely fooled me until I reached the last paragraph. I am willing to do just about anything for a perfect piece of toast but I thought as I read that this is way too much! Good job for a big laugh. Eek! You had me the whole time! I just thought you were a little ‘maniaque’ over toast when I read about 17.6 slices/min (how did she time that one?–I marvelled). Good one! I am reminded of the writing of Elizabeth David on Toast which I read in “A Taste of the Sun.” She regards toast as one of the foods that mean home and comfort. If you haven’t read it, you should. Have the big brother of your toaster. Its a two slot. Mine has the little handle but not the little knob. They should got together. Anyone who wonders about vintage toastmasters, the old ones from the ’30s are bulletproof and a restored on will last forever, way better than any modern appliance. I have the first model TM made (looks like this one only has 3 levers and no dial), one lever lowers bread, one is the timer, and the other is a pre-release for popping it up ahead of the time. The most popular is the 1949 Sunbeam model that looks like a Volkswagen bug, there are cheap copies still made of that one today in China!